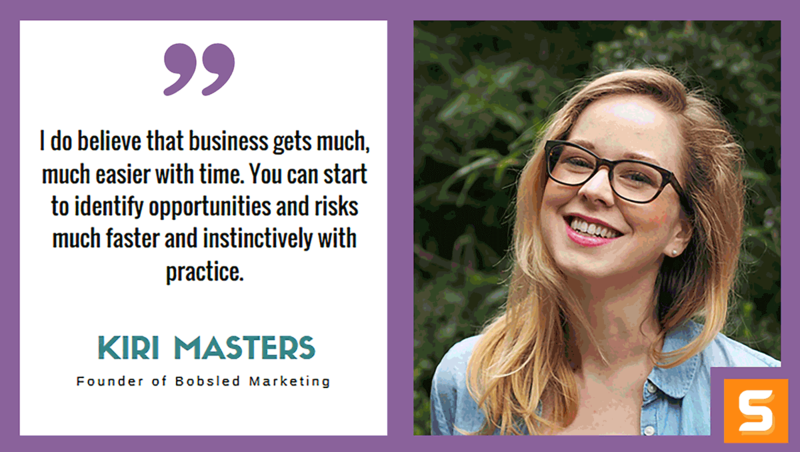 Kiri Masters is the founder of Bobsled Marketing, a marketing agency which helps brands to grow their sales on Amazon. She started her first bootstrapped product business, I Like That Lamp, in 2013. Launching the products on Amazon had such a transformative effect on the business that she left her job as a commercial banker at JP Morgan Chase in New York in early 2015. Kiri founded Bobsled Marketing after recognizing that many product businesses would benefit greatly from selling on Amazon, but have neither the time or experience to properly launch their products there. She developed a comprehensive process to launch and optimize product listings on Amazon to drive maximum revenue through the channel. This same process has now been replicated by the Bobsled Marketing team for hundreds of products across most product categories on Amazon. Kiri has a Bachelor of Marketing & PR from the University of Notre Dame Australia. Today, Kiri lives in Brooklyn, NY with her husband. In this interview, Kiri talks about how she got her clients and what sets her business apart from the considerable amount of competition out there. She also shares her best traits and business ideals which took her to where she's at today. Enjoy! Okay, so Kiri at what point did you realize you’re really on to something? When we started getting organic, inbound inquiries to our website, rather than hunting down new clients through outbound lead gen efforts. Where did you draw your competitive edge from initially? I had “walked the talk” myself by building my own ecommerce brand and selling products on Amazon. This made it easy to relate to our client base of consumer brand owners looking to launch and grow on Amazon. People trust people who’ve already accomplished what they’re looking to do. To date, other than yourself who or what has been Bobsled Marketing’s greatest asset? Timing. Though building Bobsled Marketing has involved a lot of hard work, there’s something to be said for being in the right place at the right time. When I started Bobsled a couple of years ago, Amazon was already a popular shopping destination. Now, it’s almost a prerequisite for serious brands to have a successful presence there. Our momentum was helped by the fact that Amazon has become increasingly popular with shoppers in the past year. At the same time, Amazon has made lots of changes to their policies and the actual process of launching and scaling on Amazon is much harder. As an entrepreneur, what are your top three strongest character traits? Taking action. Though I like to map out a rough plan first, I’ve learned to harness my impulsiveness and see where new ideas take me. Willingness to delegate. I’m always willing to outsource tasks and responsibilities to others. That’s the only way to free up your time as an entrepreneur and spend it in areas where you have unique abilities - the things that ‘only you’ can do. Building relationships. I have always enjoyed meeting people and finding common ground. In the beginning, that’s especially important for selling your product or service. Later, it’s important for making progress with your team. And finally, in developing partnerships which are mutually beneficial. What advice would you give to new startups facing funding issues? Both my companies were bootstrapped, so I can’t comment on the funding process or alternatives. I do recommend bootstrapping where it makes sense - it requires a lot of discipline around spending, and it generally means taking longer to grow. But you retain ultimate control over your company forever. What major challenge/milestone is Bobsled Marketing working towards right now? Diversifying our service offerings. It’s not ideal to rely on servicing a single platform. Diversifying in terms of size/sophistication of our client base (mix of larger and smaller clients), geography, and platform (e.g. Amazon, Walmart, Shopify, etc) is the next step for us. How did you overcome your biggest life/work balance mistake thus far? There hasn’t been a single ‘breaking point’ around my work/life balance. But I do choose to look at life in terms of seasons. Some seasons in life are about working really hard, hustling, and there not much time for anything else. Other seasons allow more balance. Right now, I’m about to go on maternity leave to have my first child, which will be a season where I focus exclusively on my family! Do you believe there’s a pattern or formula to modern business success? No. But I do believe that business gets much, much easier with time. You can start to identify opportunities and risks much faster and instinctively with practice. If the Bobsled Marketing brand had theme music, what would it sound like? I’m Australian, so it would probably be an AC/DC power anthem! What advice you got for folks considering setting up shop in New York? You pay a premium for being in New York, so make the most of the networking opportunities. Being part of a co-working space is a great way to meet other founders & small businesses.